Everyone in Edmonton for the fringe, see Harrington & Kauffman's new show, "Cabaret Terrarium"! Tell 'em Tom sent you! Rick Bayless is the coolest .... Recorded while riding on the M14 bus uptown on 1st Avenue. The hipster part of town. Inspired by a conversation with Randy and Kevin Chow. 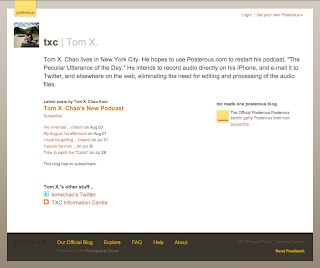 I am attempting to revive "The Peculiar Utterance of the Day" podcast as a new micro-podcast, hosted on Posterous.com. I am recording audio on my iPhone using the built-in Voice Memos application, and e-mailing it directly to the web. Please listen at http://txc.posterous.com/ Feel free to comment on the new format, in particular ease of use, and the audio quality.